This blog post was published on June 5, 2015 and may contain outdated information. 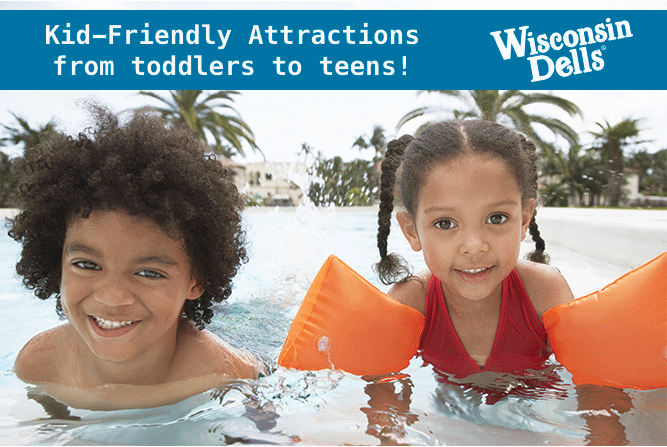 From toddlers to teens, finding where to take your kids in Wisconsin Dells can be confusing. Does this attraction allow babies? Will that attraction be fun for my children? Reading online reviews and calling the business to see the age requirement can be such a hassle! I’ve put together a sample list of a few Wisconsin Dells attractions where you can take your kids for some fun based on their age range. *At Knuckleheads Trampoline Park * Rides * Bowling, there are many attractions for the little ones, including the Flying Tigers ride, Ball-O-City soft play area, and kids Jumping Pillow! With many kid-friendly activities and many attractions for the older kids, this is a family-friendly environment for the whole family. *Timbavati Wildlife Park is for all ages. See the pig races, experience the 15 acres of park animals, or ride the safari train! Have Take a stroll through the wildlife park and even hand-feed some of the wild animals! *The Riverside & Great Northern Railway, just north of Wisconsin Dells offers a learning experience, as well as daily railway rides to visitors. Ride the locomotive, or visit during one of their many events throughout the year. *Most Wisconsin Dells Waterparks have a section of the waterpark designed for the kiddies under 3. Whether fastened into a swing, exploring a small slide, or even riding a baby lazy river, you’ll find a kiddie area at most area Waterparks. *Toddlers and the whole family can feed and pet over 100 tame deer at the Wisconsin Deer Park. Get close to white tail deer and learn about their different life-cycle stages through the 28 acres of park. *Catch & release fish, as well as receive free bait & tackle when you fish at B & H Trout Fishing & Bait Shop. Only pay for what you catch. They’ll clean your entire catch and even put it on ice for the low cost of $5! *Circus World Museum offers daily Big Top Performances as well as KidsWorld Interactive Circus, an Elephant encounter and daily illusion shows. Bring the whole family for a day of fun and magic! *If you want to experience a little thrill and still learn about the natural history of Wisconsin Dells, I’d suggest taking a Duck tour. These boats travel on both land and water. In the Dells, we have 2 great duck companies; Dells Army Ducks and Original Wisconsin Ducks! *America’s Largest Waterpark, Noah’s Ark Waterpark, features dozens of attractions, waterslides, lazy rivers, wave pools, and dry activities for kids and adults of all ages. Take a trip on the infamous Dark Voyage or raft your way down the Congo Bongo! *Paint It! Pottery Shop lets you take a piece of your vacation home with you! Choose from one of their clay creations, then paint and decorate it to your liking. They fire it up in the kiln, and you have a handmade treasure to take home! *Choose from 5- 18-hole mini golf courses of all skill levels at Pirates Cove Adventure Golf. Play among the waterfalls, footbridges, and mountainous terrain while learning about famous pirates such as Blackbeard! *Explore many oddities and journey through the Temple of Discovery at Ripley’s Believe it or Not! You won’t believe some of the unique artifacts that have been collected from all over the world! A walk through the Duct Tape room, made from thousands of rolls of Duct Tape is something you have to see to believe. *Ride the Hellcat Coaster, plunge down the Howling Log Flume, or cool off on the Bumper Boats at Timber Falls Adventure Park. On top of that, Timber Falls boasts it own 18 hole mini golf course, right on the river! *The Tommy Bartlett Show is in its 63rd season of land and water entertainment. Known as the “Greatest Show on H2O”, you’ll see daredevil stunt-artists, extreme water-skiing, and incredible boat maneuvers as well as a fun stage show with tricks and jaw-dropping entertainment. *The kids will enjoy a huge Lazer Tag Arena, Prize Arcade, Bumper Cars, and 3D Black Light Mini Golf at Wild Fun Zone. If you’ve never tried 3D black light glow mini golf, this is the place to explore this unique activity! *Mine your own gems from all over the world and take your treasures home with you when you visit Dells Mining Co.! You can even create your own custom gemstone jewelry and find unique gifts and souvenirs here! *Get trapped in a maze with twisted torture victims and explore 13 bone-chilling chambers at Ghost Outpost Haunted House. Only for the brave, this haunted house will amuse and scare the avid thrill-seeker. *Jump around at Knuckleheads Trampoline Park! Play on the open jump court, leap into the foam pit, or challenge your friends to a game of dodgeball on the trampoline dodgeball court. Slam Dunk Basketball hoops of all heights are meant for jumpers of any age at Knuckleheads. *Join your family in the quest to find the golden skull as you walk through Lost Temple. Follow the fearless tour guides and unlock the mystery of where the golden skull is hidden! *Watch lumberjacks race across rolling logs, climb obstacle poles, throw axes, and hot saw wood with 6 ft saws at Paul Bunyan’s Northwoods Lumberjack Show. Located right next to the famous Paul Bunyan’s Cook Shanty, this show is entertaining for the whole family. *The Palace Theater is putting on quite a few spectacular live shows this year. With entertainment for the whole family, you’ll find a musical or show for both kids and adults. *Tommy Bartlett Exploratory is filled with over 175 hands-on interactive activities to boggle your brain. This is also the only place in the entire world where you can see an authentic Russian Space Station MIR Core module. *Explore the secret passageways, physical obstacles, and endearing illusions as you explore the 13,000 sq. foot Quadrasphere that is Wizard Quest! Free the trapped wizards and use teamwork to help save them from Havoc, the evil sorcerer! *Enjoy the sharp turns, small hills, bridges and waterfalls as you speed by ADare Go Karts. These go karts are for individuals wanting maximum excitement! If the little ones aren’t big enough for a high-speed race, ADare also offers a Jr. track which is easy going and meant for smaller kids and teens. *Enjoy the thrill of the old west with a one hour guided tour by horseback at Canyon Creek Riding Stables. See wildlife, explore the beautiful lost canyon, and find adventure along the way. *When you need a little cooling off and you are seeking some waves, hop on a Jet Boat ride. 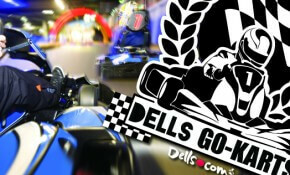 See the natural scenery of the Dells at high speeds and ultimate exhilaration. You will get wet, so be sure to pack a towel! In the Dells, you can find Captain Ron’s Original Jet Boats, Jet Boat Adventures, and Wildthing Jet Boats. *Spend the day on a Ski Boat, Waverunner, Pontoon, Cayak, Canoe, or Paddle Board with a rental from Dells Watersports. Specializing in watersport rentals, take advantage of the beautiful Lake Delton on your next visit to Wisconsin Dells. *At Mt. Olympus Theme Park & Water Park, the thrill never stops! Roller Coasters, Go Karts, Waterslides, Wave Pools, Lazy Rivers, and many many other activities await your visit at Mt. Olympus Resorts. America’s Largest Water and Theme Park Resort offers over 1,500 hotel rooms, all offering free access to their parks! *In Wisconsin Dells, you can find some of the best golf courses in the state. Play amongst beautiful scenery, pristine landscape, and challenge yourself at a few of the over 20 area golf courses! Before you go, pick up a Golf Card and score yourself 2-for-1 green fees at most of the areas golf courses. *See hundreds of nostalgic toys, games, and trinkets at Bidder No. 4. This isn’t your typical antique store. With both “Play for it” or “Pay for it” options, find out more information when you check out Bidder No. 4! *Bigfoot Zipline Tours are 2.5 hours of excitement for those of you who enjoy nature and love a little thrill! 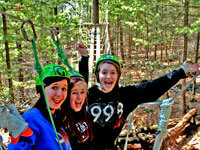 Zip from tower to tower over the majestic Oak Trees and Northwood Pines! *Dells Zombie Outbreak is an experience right out of The Walking Dead. Use real-life replicas of military weapons to kill the zombies that appear in front of you. Not for the faint at heart. *This year marks the 150th anniversary of the H. H. Bennett Studio. This interactive museum is the oldest operating business in Wisconsin Dells and displays the beautiful landscape photography that originally brought people to the Wisconsin Dells area. With hands-on exhibits, you’ll have fun exploring the H. H. Bennett Studio. *Relax on a horse-drawn wagon tour through cliff-walled gorges on Lost Canyon Tours. This half hour tour takes you to some spots in the Dells deepest canyon where the sun hasn’t reached in over 50,000 years! *Wisconsin Dells newest attraction, the Pinball Arcade Museum, features dozens of retro pinball games, arcade racing games, and jukeboxes ranging from the 1930’s to the 1980’s. For a $10 admission fee, play all day, as all of the vintage games are set to free-play. *Float until your hearts content down the Wisconsin River and stop along sand bars and beaches with tube rentals from River’s Edge Tubing. Experience this natural lazy river with friends or family and escape the warm weather with a dip in the cool river. *Enjoy dinner and a night of fun when you step aboard a Sunset Dinner Cruise. With musical entertainment and beautiful natural scenery as the sun sets, you’ll enjoy cruising down the Wisconsin River on a Sunset Dinner Cruise. 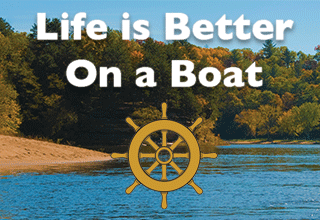 *Take an Upper or Lower Dells Boat Tour and explore the beautiful sandstone rock formations along the Wisconsin River as well as learn the rich history of Wisconsin Dells. Bring your cameras as you cruise on one of these scenic tours! *Cruise through 6 towers over 60 feet above the ground on a Wilderness Canyon Zip Line Tour. Glide past the tree tops with your family and see the canyon beneath you! *Wisconsin Dells has a few surrounding wineries with daily winery tours for those of you 21+ to enjoy! Relax and unwind with a glass of your favorite vino on your next Dells vacation. *While in Wisconsin Dells, be sure to check out the show schedule for the Wisconsin Opry! If you enjoy modern country music, bluegrass, or fiddling as well as sing-a-alongs, a home-cooked meal, and toe-tappin’ fun, then this is the place for you! Ride the Newest Canopy Tour in the Dells Featuring 18 Zip Lines!